BREAKING NEWS UPDATE!!!! PRIME DAY has officially started! Happy Monday everyone!!! A little over 15 books went live early today, and I’ll be adding more throughout the day. Also don’t forget!! PRIME DAY starts early today (3pm EST!!!) and ALL DAY TOMORROW! I. CAN’T. WAIT!!! And yes, I will add the best deals I can find, to today and tomorrow’s post (in their own section). 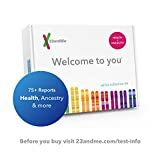 23andMe DNA Test – Health + Ancestry Personal Genetic Service – 75+ Online Reports – includes at-home saliva collection kit <— PRIME DAY DNA KITS SUPER-SALES!!! I got mine done last year (I’m VERY French LOL!! ), and this kit comes with the health part, too!!! I have that too, and I found out some very awesome things about myself. Bose QuietComfort 25 Acoustic Noise Cancelling Headphones for Apple devices – Black (wired, 3.5mm) <— BOSE HEADPHONES!!! iRobot Roomba 671 Robot Vacuum with Wi-Fi Connectivity, Works with Alexa, Good for Pet Hair, Carpets, and Hard Floors <— ROOOOOOOMBA ALERT!!!! PRIME DAY SALE RIGHT NOW!! I LOVE mine. I used it multiple times a week, and once, when my family was coming I pulled out my Dyson to give my carpets a “proper” vacuuming and guess what? The canister was pretty much EMPTY after I finished vacuuming. That’s how good my Roomba is. P.S. Another don’t forget: We ‘re having a HUGE buddy-read right here on the blog for All Your Perfects: A Novel by Colleen Hoover (going live at midnight)!! And umm… you guys. I was bad. 😉 I started it (my review copy). I was only taste-testing. I promise!!! AND OMG I AM HOOKED ALREADY. This is going to be an AWESOME read. LOOK WHAT JUST WENT LIVE !!! All Your Perfects: A Novel by Colleen Hoover – July 17th 2018 <— WE’RE BUDDY-READING THIS ONE!!! !!!! Headed to grocery store and think I will make pepperoncini pot roast!! Yum! Maryse, think I could throw some of my fresh rosemary in there? Wasn’t sure how it would do in crockpot for 8 hrs. Looking forward to All Your Perfects going live. Eh… Leslie. I’m not sure the flavor profile of pepperoncini would work well with rosemary. Such opposing flavors, and rosemary is very powerful. You’ll have so much flavor from the pepper and the juices, you won’t need anything else. MARYSE!!!!!!!!!! YOU PROMISED NO PEEKING!!!!!!!!!!! A BUDDY READ DOESN’T MEAN “YOU READ YOUR ARC EARLY” unless you get Colleen to share one with all of us? Tasha and Ela!!! It’s so good already, but but but!! In my defense, I won’t have time to read much tonight, so I won’t get ahead at all (I have to prepare the Tuesday release post). So when you guys start, we’ll all be at the same level. Cut off the rest of my comment… *fingers crossed*) and the echo dot and a couple other things. I saved $20, thought it should’ve been $40. Now I know why. *sigh*. I’m all backwards, this is the biggest thing I hate w/sleep depro. Besides migraines. I actually sent my Sephora package to the neighbors across the street too. They don’t even live there yet, only come on the weekends. I didn’t realize until a week later when I called to ask why it said it delivered a week ago and I didn’t get anything. I was soo embarrassed. Thankfully, they got it and all is well, but that’s just one of my many mishaps lately. Sometimes I Lie by Alice Feeney is on sale TODAY only for 2.99…one click! so I did not add. The pepperoncini give so much flavor, nothing else is needed. I just love rosemary with potatoes though…so I have to try it with diff dish. PRIME DAY!!!! That alone calls for some strong, sweet martinis. Lol Leslie! Lucky for me, it’s a young man over there. He’s been working on it since last fall and is getting married soon. I haven’t seen the fiancé yet, maybe it’s a surprise? Anyway, his Mom took it and tried to bring it back to the post office,but it was a UPS package so that didn’t work. Lucky me, lol. And Sephora was gracious enough to refund my money when I called, (not shipping though, which is fair) so win, win. 1. Sometimes I just sit and smile for no reason what so ever. I’ll watch tv, read a book, be lost in my head and realize at some point that I’ve just been sitting there smiling. Forever. Creepy, right?! 2. Jasper Lee is 2 months old today! He’s a chatty Charles like his siblings (coos a lot and voices his displeasure ;)), a nosy Nelson (always peeking, even after he’s fallen asleep, too see what’s going on), and a spoiled stinker (needs to be held always, but I’ll take it). He gets his 2 month shots and all that tomorrow :’(. 3. My daughter’s finishing up summer swim team this week and she’s made it to A champs! Huge improvement from just last year when she started. 1.) I can’t wait to read All Your Perfects. 3.) I just ate Mississippi pot roast, but with pork, instead. 🙂 It’s delicious. I know I just asked not too long ago about those Clairaeonics…a ton of em are like 50% off on Amazon now. 1. All Your Perfects. Enough said. 2. Prime day is going to make a huge dent in my bank account. Only the 6 quarts is sold out. The other two are there. WOO-HOOOOOOOO!!!! I didn’t even think to check those! 1. My hubs just pulled an “Amy’s hub” and interrupted me reading 5 times for silly reasons (one of them to tell me to look at Jessica Simpson’s face to determine if she has had cosmetic surgery). Seriously?!?? 2. I had Mississippi pot roast for dinner and it was DELISH! Potatoes are my fave. They totally sucked in all the pepperoncini flavor. 1. This heat is sucking all my energy out. 2. I want some things from the grocery store……but this heat. 3. Hmm. In this group I’d totally be the one interrupting you all as you try and read. I one-clicked Love Machine! I’m saving this one for the beach! Lol, you sound shy about it Tasha. I have to listen to more of his songs, he does have a great voice. And he is age appropriate, lol. 1. Want to buddy read All Your Perfects. 2. I’m trying to just do KU and AYP is $8.99!!! 3. Listening to this song makes me smile. So if there’s an expensive ebook you’ve been wanting to buy (like All Your Perfects is $8.99), if you buy it, then you’ll get a 30% ($2.70) credit toward your next ebook! Thanks Nay! I was on the fence and that just pushed me over! I just received a surprise in my Kindle library. One chapter into All Your Perfects and now I have to take some Z-Quil or else I’ll stay up all night reading it. Especially after that first chapter. ESPECIALLY after the first few lines of the second chapter. Agreed, Amy. My first thought at the end of Chapter 1 was, ‘well, that’s a hell of a first chapter.” I have to go to bed now though, I’ll be back up at 4 or 5. I can’t sleep so watching Carpool Karaoke. Paul McCartney. Gah. I love him. But hard to watch a bit too. Just some of these icons getting older, which is good, but it is going to hurt to lose them. Need some gooood recipes. Just ordered an insta pot. Counting on you. 6!!! It’s a record. I got to sleep till 6 for the 2nd feeding with NO interference from me. Best. Night. Ever. Where can I find your best books of the year list after 2013?